Question: Are you looking for an exciting, dynamic, and in-demand career in the medical field? Answer: Become a medical assistant! With the growing number of people visiting medical clinics and hospitals in St. Louis (and across the US), the job market’s demand for this allied health professional is on the rise, too. Fortunately, training programs that can last a year or less are lowering the barrier to entry for parents and others with full-time jobs (sometimes more than one) wanting to level-up in their careers into a field where they can make a real difference. For individuals who are level-headed, good with people, and love helping others, a career in medical assisting offers a number of different tracks to choose from. 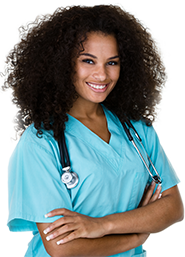 There are in fact several kinds of medical assistant. Some assistants have a clinical focus, performing functions like preparing patients for the doctor, providing minor care to patients—even authorizing prescription refills—that are normally associated with nurses. Others spend most of their time on administrative front desk and back office responsibilities like checking patients in and handling the facility’s paperwork. Most perform a combination of the two. In every case, though, the medical assistant reduces the strain on doctors’ time by taking critical tasks off their plate. Licensing requirements vary some from state to state, but in Missouri, where medical assistants are usually directly involved in patient care and treatment (under the direction of either doctors or nurses) in addition to some clerical work, most employers require all their medical assistants to either have an RMA certification (by American Medical Technologists, or AMT) or a CMA certification (by the American Association of Medical Assistants, or the AAMA). Some medical assistants are required to offer mostly administrative support to the practice where they are employed, such as making appointments and submitting insurance claims. Others are assigned more clinical or care-based tasks, such as taking down a patient’s height and weight. Medical assistants working in specialist practices may perform duties specific to the practice’s specialty. Perform diagnostic testing, assist in eye treatments and emergencies, and perform patient education as an ophthalmology medical assistant. Assist with Pap testing and breast exams, minor gynecological surgery and caring for pregnant women as an OB/GYN medical assistant. Graduates of a medical assistant program have many options to choose from when it comes to work environment. Medical Clinics are smaller-scale and often focus on one niche of medicine (pediatrics or cardiology, for example). Medical assistants at a medical clinic can expect a smaller number of regular patients, few urgent or complicated concerns, and regular, consistent work hours. Outpatient Care Centers focus on pre-planned surgeries. They share some attributes with medical clinics, such as the stable schedule, but they have a constantly changing roster of patients. As outpatient centers associated with hospitals and other large facilities increase their caseloads and assign medical assistants more specialized tasks, positions here are likely to become more fast-paced. Private Medical Practices are like clinics, but they are specifically tied to one or more professionals who own the facility. Because they work so closely with the lead physician, a medical assistant here is likely to need to shoulder a greater percentage of the administrative responsibilities and also be flexible as the doctor adjusts hours, caseloads, and pay scales, to meet the needs of patients while keeping the lights on. Nursing Homes and Assisted Living Facilities, although it depends on the facility, often pay better than a clinic. Unlike the steady flow of new patients you’ll experience at an outpatient care center or hospital, patients at nursing homes will remain under your care for longer periods of time. Because nursing facilities provide 24-hour care to their residents, you may be required to work in shifts or during weekends. Hospitals typically offer staff higher pay and a fast-paced work environment. Because of their size and the high number of patients they treat, hospitals often have a wider variety of roles available for medical assistants. However, hospitals may require medical assistants do shift work or weekend rotations. As you can see, different environments have their own schedule, pace, and feel, meaning freshly minted medical assistants can position themselves for a career that fits well with their interests and personality. Medical assisting might just be your dream job come true! Educational and certification requirements vary from state to state. In Missouri, a degree certification in medical assisting is not required by the state, but graduating from a quality medical assisting education program and passing certification will give you a strong advantage when applying for a medical assistant position and is increasingly a requirement to be employed at many hospitals and clinics. While Missouri technically does not require medical assistants complete a degree program or be certified, many employers do require it. In most cases, those interested in obtaining a medical assistant certification will need to complete a degree program at a school that is accredited in medical assisting. With an accredited degree program, freshly-minted graduates should expect to take (and pass) an exam for either the Certified Medical Assistant (CMA) or Registered Medical Assistant (RMA) credential, demonstrating that they understand and have committed to nationally-recognized standards and best practices. Again, these credentials are not required or overseen by the state of Missouri, but many employers treat them as a precondition for employment, or at least for promotion. 147 out of 210 questions (70%) must be answered correctly in order to pass. The test is timed, and students are given exactly 2 hours to complete it. The RMA can be renewed every three years, in compliance with the Certification Continuation Program (CCP) as long as AMT Standards of Practice are adhered to. Is Medical Assisting Right for You? Are you up for the challenge of caring for patients in a medical setting? Would you like to learn more about becoming a medical assistant? With strong job growth in the medical sector in the St. Louis area and across the US, there are many opportunities for skilled medical assistants. Give us a call at 800.695.5550 to schedule a campus tour so you can learn how Midwest Institute can help you get there.